Join us at Harpers Mill to experience the fun place to live! A community master-planned for your enjoyment which offers resort-style amenities and a diversity of homes and styles including Single-Family, Custom Homes, Cottage Homes, & Active Adult Low Maintenance Homes starting in the upper $290’s- $500’s+. Sunday, Oct. 21st – Join us for our annual Fall Festival! 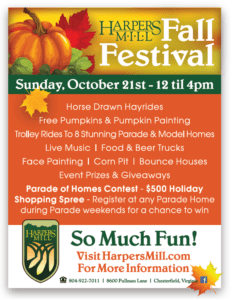 Tour Harpers Mill by trolley and then return to Club Park to enjoy live music, beer and food trucks, a horse drawn hay hide, bounce houses, face painting, free pumpkins and pumpkin painting, a corn pit, prizes, giveaways and more! Parade of Homes Contest – $500 Holiday Shopping Spree – Register at any of the Parade of Homes in Harpers Mill during Parade weekends for a chance to win. Enter at all 5 homes in the parade for the best chance to win!